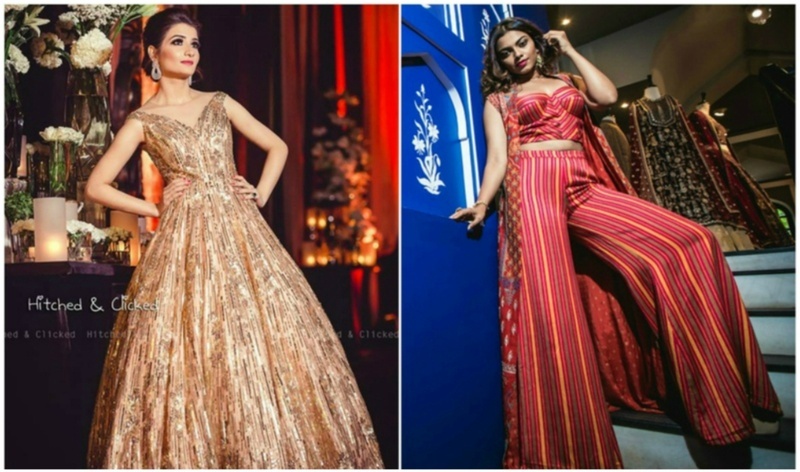 Top 10 Indo Western Outfits and Gowns for your 2018 Cocktail Party! While all the pre-wedding ceremonies demand a full blown traditional look, your cocktail night will be an event where you can give your traditional Indian wear a rest. Although we did came across a few brides who effortlessly aced the traditional attire with an edgy twist - bringing the muchneeded drama to their cocktail night! This Manish Malhotra gown is a steal with its striking silhouette and intricate gold detailing perfect for your cocktail night. This one is a Weddingz.in exclusive pick for your cocktail night. We picked this red and yellow striped co-ord comprising of a bustier and flared pants paired with a voluminous jacket from Anita Dongre giving the whole indo-western vibe. This favourite is both a classic and modern outfit by Abu Jani Sandeep Khosla with its dazzling appeal, free-flowing fabric, fringed benefits and intricate designs. It’s perfect for cocktail night with the off-shoulder bodice allowing you to be carefree while you dance your night off. This deep red ball gown with the minimal gota embroidery on it, is a sight for sore eyes. Now this is what we meant by bringing an edgy twist to the traditional attire. This bride opted for a dhoti saree by Rose Room Couture turning heads wherever she went. Ruffles are big this season and this bride incorporated the two hottest trends of the season in her attire - ruffles and pastels. She she sure killed with her cocktail gown being on point. This outfit has got party written all over it. We love the way this self designed, emerald green ensemble by the bride is brought to life with sequins and dazzling stones! Sagarika Ghatge looked radiant in a pastel, embroidered lehenga(draped as a saree) which she paired with statement silver jewellery for her cocktail party. For their night of drinking and dancing, Hazel Keech stepped out in a white lehenga with a plain gold border and a jacket with heavy gold embroidery. The only thing you should keep in mind while finalizing your cocktail outfit is to opt for something which will offer some much-needed mobility, be it for killing it on the dance floor or juggling between a glass of wine and a phone in hand.